SEATTLE, WA--(Marketwired - Apr 15, 2014) - EVIDENCE.com, a business unit of TASER International, (NASDAQ: TASR) was selected for up to a 500 unit AXON body-worn video camera proof of concept pilot by the Mayor's Office of Policing and Crime (MOPAC) for the Metropolitan Police Service (MPS) through its UK distributor Tactical Safety Responses (TSR). The tender included both AXONbody™ cameras and EVIDENCE.com as the backend data management system as part of an evaluation being conducted by the MPS. The one-year pilot, which is set to roll out soon, is for the concept of body-worn video (BWV) under the College of Policing academic rigour, and is the largest known urban pilot of BWV cameras. It will be rolled out across nine London boroughs and up to 500 AXON cameras will be deployed. "We're thrilled that one of the leading police agencies in the world has selected EVIDENCE.com to provide them with the technology that is going to help them securely manage their digital evidence from the initial 500 body cameras," said Jeff Kukowski, Chief Operating Officer of TASER International. "Our AXON body-worn cameras are a game changer for law enforcement agencies worldwide and are helping police officers reduce crime and build safer communities." "EVIDENCE.com continues to expand into new international markets as law enforcement officials around the world look to us to provide secure and cost-effective solutions," said Rick Smith, Chief Executive Officer and founder of TASER. "EVIDENCE.com has been in New Zealand since 2009 and has expanded its data-center deployments on Amazon Web Services to Dublin, Ireland; São Paulo, Brazil; and Sydney, Australia. We look forward to continuing to demonstrate the security and reliability of our back-end data management system and growing the EVIDENCE.com brand globally." EVIDENCE.com helps police capture, manage, and share their digital evidence without the complexity or cost of installing in-house servers. It enables greater transparency through seamless integration with the industry-leading AXON BWV cameras. EVIDENCE.com is the most secure, scalable, and cost-effective solution for managing all types of digital evidence. EVIDENCE.com automates the upload process to ensure security and integrity while keeping officers in the field rather than sitting at computers. Results of a University of Cambridge year-long study conducted by US police chief, William A. Farrar of Rialto, California, that investigated whether officers' use of video cameras could bring measurable benefits to relations between police and members of the public showed an 88% reduction in complaints against officers and a 60% reduction in uses of force after implementation of TASER's AXONflex BWV cameras. These small, yet highly visible cameras, powered by a pocketsize battery pack, can attach securely to sunglasses, a cap, a shirt collar, or a head mount and, when recording, capture a wide-angle, full-colour view of what an officer is facing. The video automatically uploads to EVIDENCE.com, a web-based computerised storage and management system, where it can be easily accessed for review. An end-user cannot tamper with video files stored online or on AXON video camera systems; files cannot be deleted or altered in any way by the user while on the device. AXON cameras by TASER are now well known in the United Kingdom from the recent hit BBC series Traffic Cops, which aired in the last couple of months. In Traffic Cops, the Yorkshire Regional Roads Crime Team has been using AXONflex™ cameras to capture incidents from their officers' points-of-view. TASER International makes communities safer with innovative public safety technologies. Founded in 1993, TASER first transformed law enforcement with its electrical weapons. 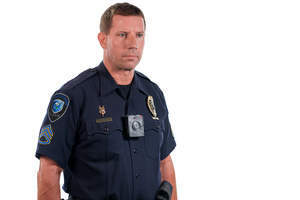 TASER continues to define smarter policing with its growing suite of technology solutions, including AXON body-worn video cameras and EVIDENCE.com, a secure digital evidence management platform. More than 123,000 lives and countless dollars have been saved with TASER's products and services. TASER® and AXON® are registered trademarks of TASER International, Inc., registered in the U.S. All rights reserved. TASER logo, AXON, AXONbody, and AXONflex are trademarks of TASER International, Inc. All rights reserved are trademarks of TASER International, Inc.
TASER International’s body-worn video camera called the AXON body™ camera system on a police uniform. Photo courtesy of TASER, Scottsdale, AZ, USA. AXON body(TM) camera by TASER comparison video. Watch how the AXON's body-worn video camera works as wearable technology compared to other body cams.